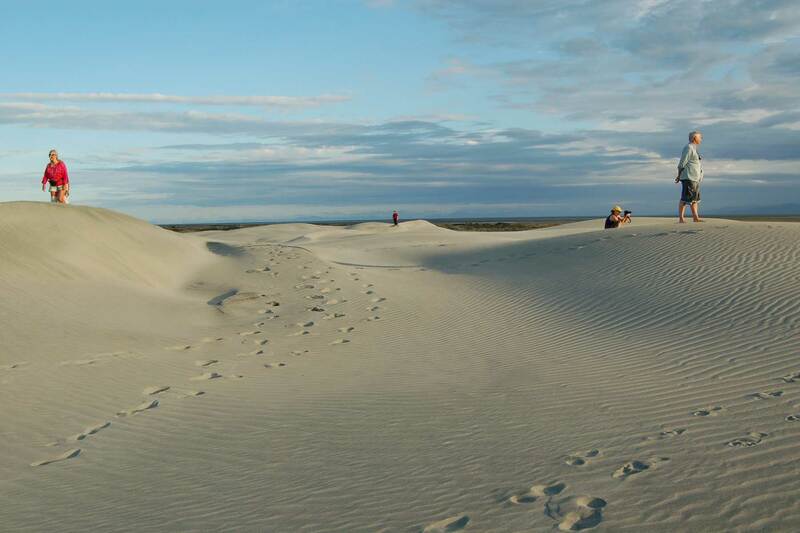 Farewell Spit – Onetahua – Nature reserve is a bird sanctuary and wetland of international importance. The spit is around 35 km long and public access is restricted to the first 4 km. Farewell Spit is more strictly protected than a national park. Vehicle access is granted only to supervised tours. Through sharing the experience of Farewell Spit it can help to raise public awareness of this precious ecosystem, so vital for migratory birds. Farewell Spit Eco Tours hold the only permit to visit the Gannet colony beyond the lighthouse and the wader feeding grounds on the inter-tidal plain. 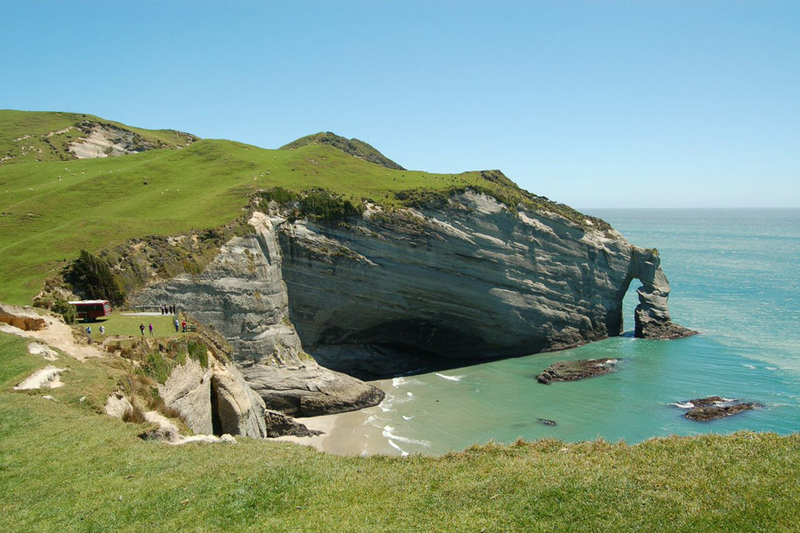 The most popular Eco Tour which, as well as exploring the spit, stops in Puponga and at the most northern point on the South Island, Cape Farewell. Stop at Fossil Point, a popular hauling out place for NZ fur seals, see fossilised shells and wormcasts emerge from blocks of mudstone cliffs. 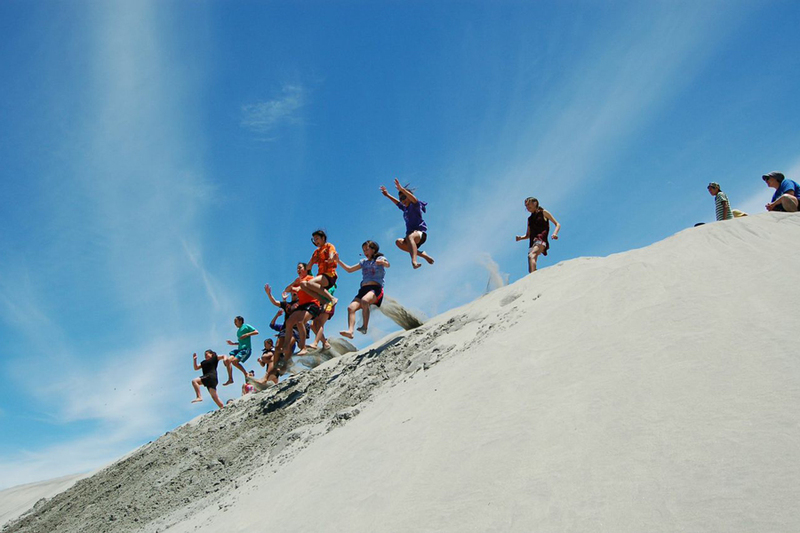 30 km along the ocean beach is the Lighthouse reserve – climb the lighthouse, learn about the spit’s maori history and have refreshments in the lighthouse keepers cottage. Next climb a sandhill for panoramic views of the ocean, dunes and the inter-tidal plain where the migrant waders from the arctic circle feed during the spring, summer & autumn. 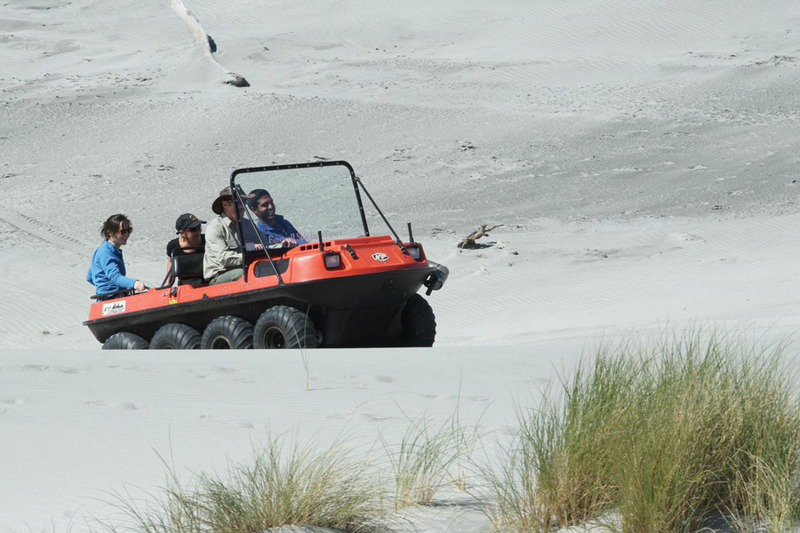 Your passionate guide will ensure you get the most from your trip, explaining the wildlife, history & ecology of Farewell Spit – see where Whales strand & uncover the mystery of the migrant waders. During the summer there are up to 20,000 godwits and 30,000 knots at the Spit as well as other Northern migratory birds, New Zealand natives and introduced species. The Farewell Spit colony is the only rocky outcrop breeding and nesting site right at sea level, affording excellent views of the parent birds caring for their young. 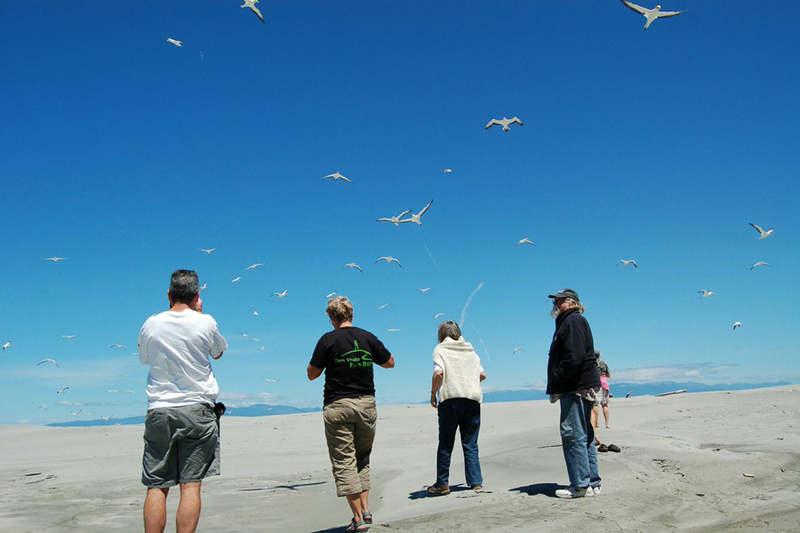 This tour travels beyond the Light House for around 2 km, where you start a 20 minute walk across the flat sand on the spit’s end to view the colony (there are approximately 5000 birds here). You may get your feet wet, as you stop to observe the gannets for 20 minutes. Viewing Gannets is a two way process – the birds are known for their curiosity and often fly low over visitors. Next visit the lighthouse for refreshments, explore the reserve & soak up the serenity. 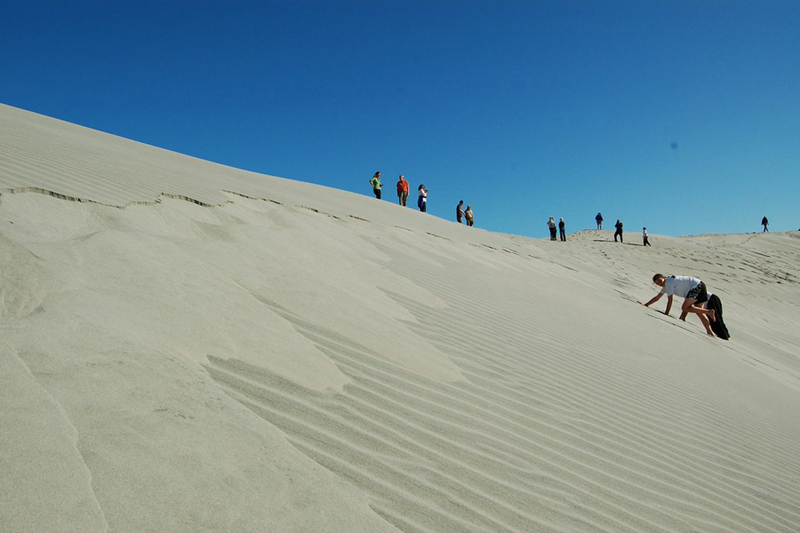 The last stop is to climb one of the huge dunes for a look into Golden bay and beyond. The Gannet Colony Tour is limited to 20 people a day September – April please book in advance. 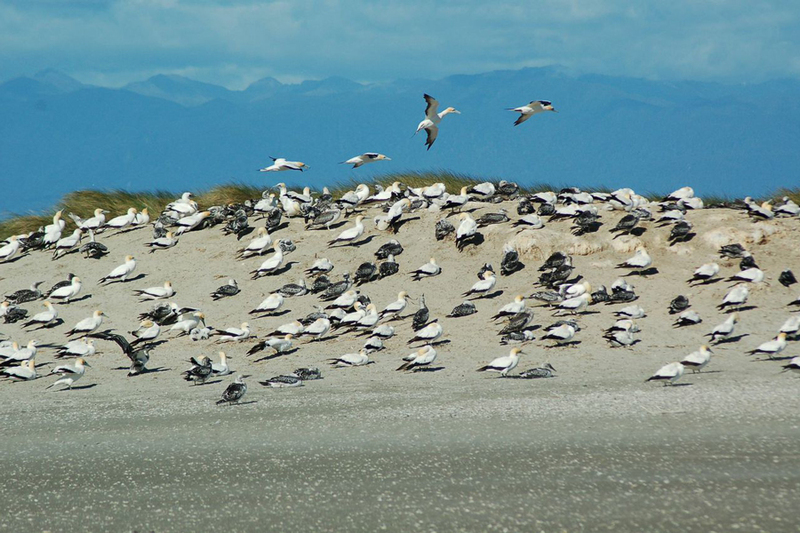 Travel to Farewell Spit as the tide is rising and spend time near the base of the Spit observing the birds flying in to roost as the tide chases them across the inter-tidal plain. The tidal range at Farewell Spit is huge – at low tide over 9 km of sand flats sweep out to the blue waters of Golden Bay. This is where you see the arctic waders come to feed. Tours are run in the best times to see the bird life; the godwits, knots, turnstones and other arctic waders, which is from late September until early April. The opportunity for this tour arises about one third of the time, numbers are restricted to a max of 10 people. Farewell Spit’s beauty is equalled by the gruelling nature of the driving conditions. 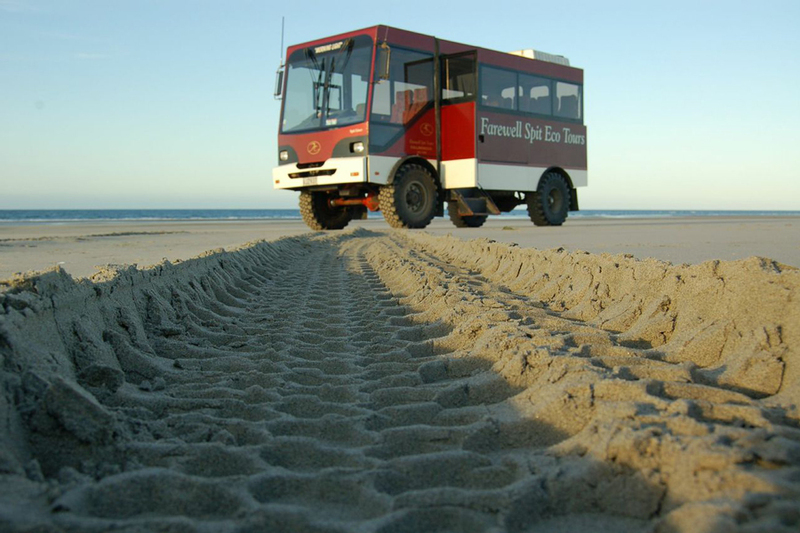 Sand, salt and sea-spray take their toll – but with the RL Bedfords which are the mainstay of our fleet we have a vehicle which is both robust and comfortable. The fleet is maintained to an exacting standard, refurbishment of the interiors is ongoing for passenger comfort and a hi-tech sound system ensures you won’t miss a word of the commentary. Tasman Street, Collingwood, Golden Bay, New Zealand.